Everybody knows that in this present globalized world, effective and good marketing strategy is the key to success for any business or organization. See more about wordpress themes for your business. Ditigal marketing has constantly made a great difference between the history that is forgotten and the winners. It is often impossible to imagine a world without marketing, considering that capitalism relies on it largely. Whether you are starting a business or have been handling the retail marketing for many years, a powerful website is definitely going to increase your marketing effort and let you reach to more prospective clients. WordPress Marketing themes are the finest tools to achieve this. Such digital marketing WordPress themes come packed with different features to collect emails, construct landing pages, make bold typography, and more. Before you move to themes, you need a great website hosting. Here you can findA2 hosting reviews, Siteground reviews, bluehost reviews and get suitable plan first. It is a WordPress digital marketing theme that is purpose built for making a website for digital marketing agency. With the SEO WP theme, you get quick access to a wide range of header layouts and styles for your site. If you’re looking for a reasonable off the shelf marketing theme, but want to leave your unique personality on the site, SEO WP and its configuration options and settings will be of great interest to you. The theme also includes premium Visual Composer pages builder plugin. If you wish to draw the high caliber customers your business deserves, you need a quality site built with WordPress digital marketing theme like Optimize. To assist you get correct feel and look for your marketing site, Optimize consist of 12 different homepage designs. As you would expect from a WordPress theme created for SEO or marketing agencies, Optimize has complete support for the best WP SEO plugins too. This theme also has the best feature and design list to help create an effective and professional site for your business. See more about wordpress portfolio themes. This is a colorful, creative, readily responsive and clever WP digital marketing theme. Seo Company combines relentlessly fast codebase which loads at fast speed and nicely plays with all the devices, platforms and browsers. The HTML5 framework underpins this theme, offering it with easy handling of most engaging multimedia content. With its visually striking whiteboard features, powered by equally impressive Slider Revolution, throngs of visitors will be dazzled and amazed by sheer beauty of the content presentation. The SEO theme is ideal for digital marketing agencies, SEO experts, agencies and freelancers, web studios, internet marketers, social media marketers, digital advertising agencies, PPC experts, Lead generation experts, and creative agencies and designers. This is a very flexible WordPress theme which is created by Haintheme. TopSEO is a clean-coded, well designed and ultimate website theme which suits perfectly for SEO agency, digital agency, social media and other marketing businesses. It has the most important features of professional themes like fully responsive layout, retina-ready, 1-click demo install and cross browser compatibility. With its simple instructions, you’ll be capable to install as well as create a site easily without any coding skills. This theme is a functional, but fully optimized theme, built with SEO and digital marketing in mind. This customizable, flexible and modern theme is ideal for marketers, social media specialists, startups, accountancy and corporate businesses. Two clean, refined and basic home page layouts provide unlimited variations. With 1-click demo install, it is incredibly simple to get started using SEOHub theme. It is an optimized and fully responsive theme for mobile devices. You can make and edit the pages using visual composer, media content manager and shortcodes and create your creative layouts within a few minutes only. See more: WordPress e-commerce themes. This is a WordPress marketing theme which is created especially for marketing and SEO agencies, SEO and SMM specialists, online marketing professionals, copywriters and similar online businesses that need a SEO friendly, fast and optimized site. This theme’s functionality is very wide and can suit any site, either a marketing agency site or SEO company, and other business site that needs perfect SEO optimization, microformats and valid code. It has superior optimization, premium plugins and powerful custom administration panel. This is a trendy and clean WP theme for marketing agency, social media specialists and SEO companies. Because of its updated business design, this theme is an excellent fit for all corporate sites. This theme has many pre-made pages. Besides, you can easily modify the pages in the front end using its visual composer plugin. SEORocket is compatible with plugins like Revolution Slider, PO composer and Swiper Slider. If you want to sell digital or software goods through your site, then this theme is compatible with Easy Digital Downloads and WooCommerce plugins. Metrics Business theme comes with the most advanced live site builder It features the most attractive design trends, enjoyable UX and latest web technologies. This theme offers a platform to drag and drop elements, select styles an always play around the feel and look of your website with instant preview, before the changes go live. The theme comes with all the needed pages and features like Service, About, Testimonials, Case Studies, FAQs, Gallery, Clients, Solutions, Products, Awesome News/Blog Pages, and all needed Digital Marketing and SEO pages. This theme is designed mainly for marketing companies that offer Marketing, Finance and SEO services along with other online marketing related services. It has unique and beautiful design which will be suited best to your web presence. This theme comes with important pages for online presence like blog, projects, shop pages, testimonials, etc. Moreover, you can modify the pages in front end utilizing the Visual Composer Plugin This theme, designed as per latest techniques and trends, can help make a website stand out. This is a flexible and modern WP theme designed for SEO companies, marketing agencies and their customers. With full features of any professional WordPress marketing theme like retina readiness, cross browser compatibility, fully responsive layout, powerful theme options and click demo install, SMART SEO is quite simple to use. As it is 100% responsive, SMART SEO looks excellent on devices and browsers of all kinds. This theme is coded keeping best SEO practices in mind. This is a specialized WordPress theme for SEO, web design and hosting. It’s completely practical, includes real content and you can implement a site within a few minutes. Easyweb comes with superior theme options, special SEO and host features, visual page builder, and live customizer. It’s fully integrated with visual composer. The great page builder helps you create complicated layouts of the posts and pages with simple drag and drop interface. It is simple to understand and modify so that you can customize it in the simplest way. See more: SEO optimized directory themes for wordpress. Marketplus is a great Marketing WordPress theme. It is simple to setup and easily customizable to suit your requirements. It comes with many prebuilt layouts and modules that can be easily mixed and matched to assist you get the best looks for your site. If your digital marketing or SEO agency needs a revamp, Marketplus intends to be all-in-one theme you’re looking for. It includes a very long form homepage’s layout which offers you with many opportunities to sell out your services and get new clients. This is a modern and clean digital agency one page WP theme. It’s an excellent corporate web solution for creative agencies, individuals, graphic designers, photographers, freelancers or other kind of creative people and institutions. Ariana has a professional and clean design with cross browser compatibility, video documentation, Google Map, SEO friendly markup, revolution slider, visual composer, etc. This is a clean, modern and creative multipurpose and multi page theme made for the SEO marketing industry. This theme’s well written codes, makes it easy for you to redesign this theme. Searchly’s well documented help files help you modify as well as edit the theme as per your wish. Both installing and customizing the theme is quite simple. All information which is required is offered in the documentation. This is a multipurpose theme mainly for digital marketing, SEO industry and relevant businesses. This theme comes with tidy, clean, creative, unique, hand tailored, and pixel perfect pages to ensure that it complies with every strict standard with the best practices. It includes all you need to begin a site for your business activities. It also is customizable to fit other similar domains with impressive, modern interface and simple to use design. SEO Grow also comes with excellent hand tailored premade SLZ shortcodes therefore the customization is yours. Read more: SEO optimized wordpress themes for real estate. SEO Wave is a great theme for SEO. It has outstandingly clean, fully professional and elegant design. SEO Wave has a simple to navigate layouts structure along with an eye catchy view. This theme is build using the Bootstrap 3 and is fully customizable for everyone. By using this great theme, you can get a high ranking on SERPs. This theme is retina ready, responsive, translation ready, has Google web fonts, additional 3 widgets, 2 header styles, 500+ font icons and FontAwesome. Radium is a beautifully crafted, clan and responsive WordPress theme. 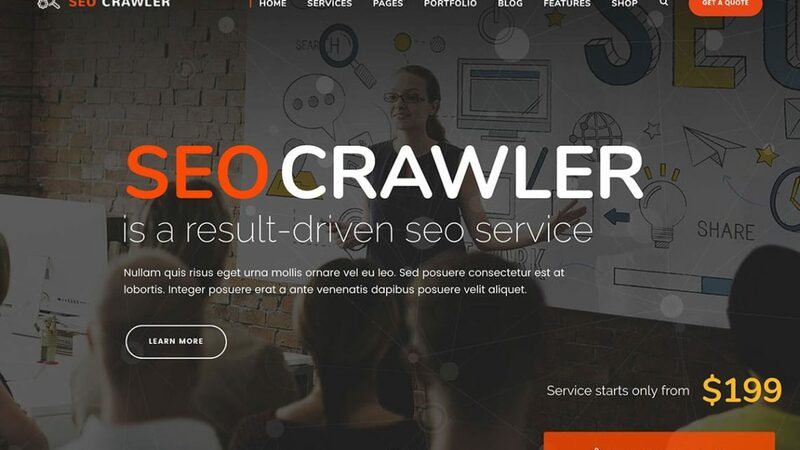 It is highly customizable, easy to use and powerful Digital Agency/SEO/ Multi Purpose theme created with a Revolution Slider and Visual composer. If you buy this theme, you will get a lifetime support. This theme is super responsive with unique look, parallax effect and unique functionality and effects. This is a customizable, simple to use and powerful theme jam-packed with great features. It is a perfect theme for SEO, Multi-Purpose and Agencies. Whether you are a WordPress beginner or a professional, you will find this theme to be easy to sue, customize and powerful. With this theme, you can create pages which look excellent at any size. It has in-built case study functionality, so that you can display your work in an extremely beautiful way and draw more clients. It’s a multipurpose responsive marketing WordPress theme that is packed with tons of custom color schemes, retina ready icons and many header options. Salbii features LayerSlider, Visual Composer, Nivo Slider, Flex Slider and intuitive theme option panel. This theme’s versatility offers you with right tools to knit elegant sites to suit your targeted audience. Salbii is also styled with ultra sharp retina ready icons set an advanced typography options. This is an exemplary WP digital marketing theme for marketing web pages. It has many pre-defined templates variations for the blogs, allowing immediate publication of posts. It has many gorgeous portfolio layouts, prolific WooCommerce plugin, is SEO ready and has 600+ impressive Google fonts. If any problem arises, you can contact their support team always. This is a versatile and powerful theme, still it stays intuitive and user friendly. It boasts a big collection of features and every feature promises to expand a site’s capabilities. If you wish to design a high quality marketing site, then Pitch is a perfect choice. This theme offers you with absolute freedom when page customization is considered. It has also included a sizable list of helpful features along with solid design which is sure to attract clients. It allows for simple personalization, still it remains accessible and user friendly. Pitch has Select Core Plugin, custom post types, full screen slider, Custom font animation, customizable mega menu, full screen menu and more. This theme has a clean code and modern design. Created on the famous HTML-CSS framework, this theme can be used by both freelancers and companies. The theme’s amazing home page versions and mockups make your products more unique and attractive. It is retina ready and responsive as well. It includes a tool known as fancyBox, which offers an elegant and nice way to add zooming functionality for the images, multi-media and html content on web pages. This WordPress digital marketing theme is fast, efficient, highly flexible, fully customizable and well supported by the pros. Whether you’re looking for conversation optimized, bold landing pages, a modern, slick blog or attractive online shop to run a business, this theme is the marketing WP theme you’ll need to make sites that deliver exceptional results and also boost your conversation. Build an online store, offer a service online or sell a product with bold products landing page – this theme has your back. It’s a professional and stunning corporate WordPress SEO theme that is perfect for accountancy and corporate businesses. It has specifically designed demo corporate marketing page ready for use and launch the new marketing site with ease. Fully packed with each premium WP plugin that you’ll ever need, you’ll have your own Corporate marketing site within a few days. With its premium forum, video tutorials and detailed documentation, you will not be left thinking how to make a perfect organic WP theme. Let your clients get immersed in your contents with the full screen images elegant animations and typography and parallax video backgrounds. As a multi-purpose digital marketing WordPress theme, Marketing Pro is design specially for online/digital marketers, business owners and SEO experts. It’s mainly focused on creating sites in the marketing, big/small businesses, Landing and SEO niches. The best part about this theme is that over 9 highly converting and beautifully designed ready-made templates are included. It comes pre=packed with Visual composer to make sure that you create a site easy and fast without knowledge of coding. Every niche based layout is available with different cohesive design.